Private and public relationships - frequently labelled as friendships - have always played a crucial role in human societies. Yet, over the centuries ideas and meanings of friendship transformed, adapting to the political and social climates of different periods. 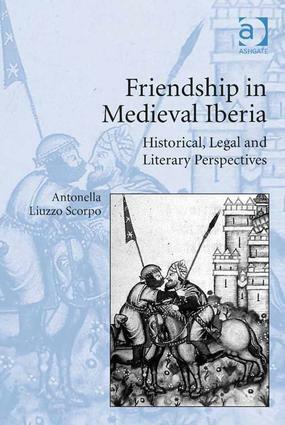 Changing concepts and practices of friendship characterized the intellectual, social, political and cultural panorama of medieval Europe, including that of thiteenth-century Iberia. Subject of conquests and 'Reconquest', land of convivencia, but also of political instability, as well as of secular and religious international power-struggles: the articulation of friendship within its borders is a particularly fraught subject to study. Drawing on some of the encyclopaedic vernacular masterpieces produced in the scriptorium of 'The Wise' King, Alfonso X of Castile (1252-84), this study explores the political, religious and social networks, inter-faith and gender relationships, legal definitions, as well as bonds of tutorship and companionship, which were frequently defined through the vocabulary and rhetoric of friendship. This study demonstares how the values and meanings of amicitia, often associated with classical, Roman, Visigothic and Eastern traditions, were transformed to adapt to Alfonso X’s cultural projects and political propaganda. This book contributes to the study of the history of emotions and cultural histories of the Middle Ages, while also emphasizing how Iberia was a peripheral, but still vital, ring in a chiain which linked it to the rest of Europe, while also occupying a central role in the historical and cultural developments of the Western Mediterranean. Antonella Liuzzo Scorpo completed her first degree in European Languages and Cultures at the University of Catania (Italy), before undertaking doctoral research at the University of Exeter. She worked at the University of Exeter and as a Lecturer in Medieval History at Queen Mary University of London, before joining the University of Lincoln in 2013. She is interested in the legal, cultural and political history of the medieval Western Mediterranean, and in particular in thirteenth-century Iberia. Her main areas of research include the history of emotions, social implications of inter-faith collaborations and political agreements, as well as the connections between friendship and gender relationships. She has also published on ideas and representations of power in medieval Castile and Leon. She has also been actively involved in international research projects with other European Institutions.